First of all, thank you for all of your wonderful birthday wishes to Roux. I gave them all to him individually, and he enjoyed them very much. On to the chocolate. I made these cookies yesterday at the bed and breakfast. 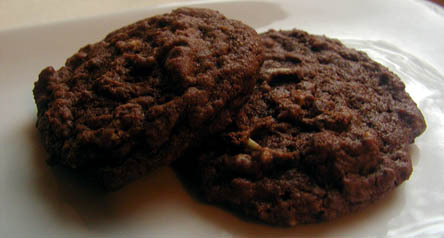 My boss occasionally buys Andes mint chips, and I love to use them in this chocolate cookie recipe. They end up soft and chewy, and I love the mix of that smooth mint with the cocoa. I think the guests like these as well, or at least I hope they do. I usually double this recipe, which makes a ton of dough for me to freeze for later. The dough is a bit ornery, though…once you mix in all the flour and cocoa, your mixer will have to work pretty hard (unless you’re cool and have a heavy-duty mixer, in which case I’m jealous). The original recipe called for adding white chocolate chips, which is also pretty yummy, or you could try peanut butter chips, butterscotch chips, nuts, or even chocolate chips for the ultimate chocolatey concoction. Combine flour, cocoa, baking soda and salt in a small bowl. Beat butter, granulated sugar, brown sugar and vanilla extract in a large mixing bowl until creamy. Add eggs one at a time, beating well after each addition. Gradually beat in flour mixture. Stir in chips. Drop by well-rounded teaspoons onto ungreased baking sheets. ooh, i love chocolate and mint! this morning i had a peppermint mocha as a deviation from my usual americano. i’m bookmarking this recipe!